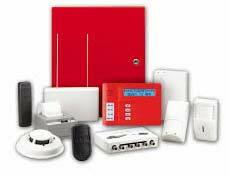 With the most recent and advanced technology, we manufacture security Fire Alarm Systems. Automatic fire alarm system from our house is widely used in residential as well as office place. We also provide better after sales services. Utilizing the technology and other available resources up to full we have created this inventive product which makes you free about the safety prospects. It ensures safety for you. Wide use in banks is the example of popularity of this product. With this we are prominent fire alarm system Manufacturer, Exporter & Supplier. The W01 / W02 / W04 / W08 / W16 multi-wire fire panels are designed to be conventional fire panels developed from microprocessor, which can monitor and control 1, 2, 4, 8, 16 zones fire information respectively. Each zone can be connected with 25 conventional fire detectors. Each W01, W02, W04 panel has 4 external devices control output points, and each W08, W16 has 6 points. Through the points, the panel can control such external devices as sounder strobe, siren, etc. The panel maximum load is 4 sounder outputs and 2 panel state outputs. The panel is designed to have internal standby batteries and space for installation (enough for two sealed acid storage batteries). The panel has test and isolating function, it also has day/night mode. It can indicate such states as normal, fault, fire alarming, short circuit and open circuit states; it also can indicate the position of the detectors which detect the fire. It is very simple and convenient to install and operate these 5 kinds of panels. All control functions start with a key switch on the keypad, and the programming function starts with the same key switch on the keypad and an internal switch. 2-Wire, Current Detecting Network, Light Labyrinth Design, DC10 - 32V Input Voltage. 4-Wire, Relay/Current Network, DC12-32V Input Voltage, Auto Reset Function/Manual Reset Function (Optional). 2-Wire, Current Detecting Network, Light Labyrinth Design, DC12 - 32V Input Voltage. 2-Wire, Current Detecting Network, Light Labyrinth Design, DC12-32V Input Voltage. 4-Wire, Relay/Current Network, DC12-32V Input Voltage. Battery Operated, Stand Alone/Network Optional, Light Labyrinth Design. Battery Operated, Wireless Network, Light Labyrinth Design. 4-Wire, Relay/Current Detecting Network, DC 10- 32V Input Voltage. Battery Operated, Stand Alone/Network Optional, Ionization Detector. Battery Operated, Wireless Network, Ionization Detector. Non Polar 2-wire, Current Detecting-Network Output. Non Polar 4-wire; High Stability; Auto Reset Function. Non Polar 4-wire; Auto Reset Function; Low Power Consumption Design. Non Polar 4-wire; MCU Processing. Non Polar 4-wire; Auto Reset Function. Non Polar 4-wire; Auto Reset Function; High Stability. Suitable for NO or NC fire or access systems. Meet the requirements of BS5839 Part. The casing molded from engineered plastic With high impact strength, high resistance to heat. With good electrical properties. All metal is of brass and phosphor bronze ensuring life long resistance against corrosion. Reset table manual call point. Suitable for NO or NC fire or access systems. Meet the requirements of BS5839 Part. The casing molded from engineered plastic. With high impact strength, high resistance to heat. With good electrical properties. All metal is of brass and phosphor bronze ensuring life long resistance against corrosion. Standard Voltage : 12 / 220 VDC (optional). Operating Current : 200mA / 12VDC. Colors Available : Red, Green, Blue and Yellow. Electronic fire sirens are intended for fire alarm applications only. Polycarbonate / ABS housing. Designed to deliver maximum loud and clear fire siren sound generated by the electronic circuit inside. Will produce the sound similar to a motorized fire siren, which normally shall be distinguishable from normal ambient sound. These fire sirens can be fixed on standard utility box. Standard Voltage : 12 / 24VDC. Operating Current : 50mA / 30mA. Flashes / Minute : 120 times / min. Service Life : 1000 hours(standard power works in succession). Colors Available : Green, Orange. Electronic Bell only. Electronic fire sirens are intended for fire alarm applications only. Polycarbonate / ABS housing. Designed to deliver maximum loud and clear fire siren sound generated by the electronic circuit inside. Will produce the sound similar to a motorized fire siren, which normally shall be distinguishable from normal ambient sound. These fire sirens can be fixed on standard utility box. Metal casing. With motor drive. For fire alarm applications only. Polycarbonate / ABS housing. Designed to deliver maximum loud and clear fire siren sound generated by the electronic circuit inside. Will produce the sound similar to a motorized fire siren, which normally shall be distinguishable from normal ambient sound. These fire sirens can be fixed on standard utility box. COFFCO represents a dramatic advancement in Fire Protection by providing various systems to protect lives. We are a company committed to excellence in providing professional Fire Suppression System, Protection Equipment and Service. We give fast, safe and reliable Fire Suppression Systems that extinguish a fire in seconds and protect electronic equipment, media, and personnel. Quality is the strong point that have made COFFCO one of the reputed brand all over the world. No Fire Fighting System is difficult for us. HFC 227ea, chemically known as Heptafluoropropane, is developed to replace Halon 1301. The Extinguishing Agent HFC 227ea is a colorless, odorless gas which does not conduct electricity and has a density that is approximately six times greater than that of air. It is an extinguishing agent with low toxicity as far as gases go, and it therefore provides sufficient security because it does not cause serious harm to persons even if they are exposed to it for relatively long periods of time. In fact, it does not leave any dirt or residue, and it is non corrosive. HFC 227ea has such characteristics as high extinguishing efficiency and quick speed and remains no residua after discharging and low toxicity, which is regarded as a kind of an ideal substitute for the Halon Extinguishant. HFC 22ea System consists of Storage Cylinder, Liquid Check Valve, High Pressure Hose, Manifold, Selective Valve, Pipe Network, Nozzle and Fire Alarm Controller, etc. HFC 227ea total saturation systems can be used to extinguish fires of all classes. HFC 227ea System remains no residum after its discharging with low toxicity, which can be applied in occupancies where there is somebody working or on duty. Application : Computer Room, Data/Equipment Control Room. Special Storage Facilities, Airports, Marine Systems, Telecommunication Buildings, Universities & Colleges, Hospitals and Petrochemical Installations. CO2 System is a bulk Cylinder storage containers to supply the CO2 Extinguishing Agent. Its Accessories connect the System to the piping manifold which distributes the CO2 Agent through the network of the pipes. The Nozzles fixed in the System regulate the flow of CO2 Agent in the protected area. CO2 Agent is Non Damaging, Non Corrosive and Versatile. CO2 System does no harm to most substances and does not leave its trace or has no pernicious effects after fire extinguishing, which is suitable for putting out fires caused by various combustible or inflammable liquid and solid substances, and for gas fire in which gas supply can be cut down before conducting extinguishing. CO2 as a kind of fire extinguishant takes such characteristics as non-conduction, non-contamination, no water damage, good extinguishing efficiency, etc. CO2 System is a kind of Fire Protection System widely used in Computer Room, Power Sub-Station Room, Switch Board Room, Central Control Room, etc. CO2 is normally colorless, odorless and during the distribution takes on the appearance of white vapor. CO2 System is used to protect a wide variety of hazards, from fragile electronic equipment to high voltage electrical equipments without any damage. The unique properties of CO2 System allow it to be used in wide range of hazards. The System can be designed into Independent Unit or Combined Distribution System according to the requirements. COFFCO's Foam Systems are designed to meet your Fire Fighting needs in Industrial, Commercial and Transportation Applications. Consisting of COFFCO components, these systems bring a rapid thorough and economical response to fires of all types. The appropriate combination of Foam Concentrate, Storage Tank, Proportioning and Foam Discharge devices, Valves, and Piping delivers the optimal level of Foam Agent to the fire, often with no external power other than water pressure to ensure correct operation. A COFFCO Foam System is more than the sum of its parts because it is designed and engineered to your application specifications, however, the parts are indeed exceptional, and many are available as replacement components or improvements for existing systems. The Automatic Sprinkler System is made up of set of Sprinklers and the relative supply piping containing water, compressed air or ambient air and valves fed by water supply sources of suitable flow rate and autonomy. The Sprinkler heads can be open or closed. When a fire breaks out in the area protected by this system, the rise in temperature causes the glass bulb to break and the water to be sprayed from the nozzle. The system is designed in such a manner that, depending on the risk, the quantity of water that is distributed by the sprinkler heads that will open is enough to extinguish or keep the fire under control. We are fire protection professionals who specialize in the design, installation of fire sprinkler alarm systems. Fire sprinklers are most effective during the fire's initial flame growth stage. A properly selected sprinkler will detect the fire's heat, initiate alarm and begin suppression within moments after flames appear. In most instances sprinklers will control fire advancement within a few minutes of their activation. This will in turn result in significantly less damage than otherwise would happen without sprinklers. Sprinkler systems offer several benefits to building owners, operators, and occupants. COFFCO Water Mist Systems use so little water that the resulting water damage is negligible if there is any. This allows the use of early detection systems triggering the water mist system without fear of a false alarm. Detectors can be used for activation as well as fast response glass bulbs. COFFCO systems can be designed as total flooding or automatic single head operated system. Sensitive areas which have been left unprotected in the past, can be protected effectively with a Water Mist system. The fine water mist reaches also hidden spaces like in shelves, unlike a sprinkler. At the same time the temperature in the protected area is significantly reduced and the fire is immediately enclosed. This effect is of particular importance to prevent spreading of the fire to other valuable goods. A much better effect in regard of smoke scrubbing is achieved by COFFCO systems compared to sprinklers and gas systems. Taking into consideration that smoke usually causes most of the damage, the smoke scrubbing can not be valued high enough especially for many applications. Application : Archives and Libraries, Stores, Public Buildings & Museums, Kitchen and Industrial Fryers, Wind Power Plants, Gas Turbines, IT Areas, etc.